A year ago in Rio de Janeiro, Brazil, the Argentine papal pretender Jorge Bergoglio (“Francis”) posed with and kissed a “crucifix” that is not only hideous, grotesque, and Modernist, but also has clear occult-Satanic symbolism. In particular, besides the odd and abstract look, the “corpus” on this cross consists merely of a blob that is supposed to be Christ’s head and two sticks representing arms, and then it adds two diagonals from the arms down, converging at the bottom, so that it forms a concave quadrilateral, a shape found in the point-down pentagram used by Satanists, especially in the Sigil of Baphomet, the “official insignium of the Church of Satan” (source). The illustration above brings out the striking similarities clearly. Here are some more images of Francis posing with and kissing this hideous cross (click the arrows to slide back and forth between images): Embed from Getty ImagesAs can be clearly seen, the “crucifix” Francis is happily holding and kissing is sinister, twisted, and occultist. It certainly has nothing to do with the Crucifixion of Jesus Christ, which it seems to mock more than anything. (For comparison, you may view a Catholic crucifix here.) For Francis, who is on the record joking about the Crucifixion of our Blessed Lord, this was simply one more episode of ridiculing and causing offense to the true religion established by the Most Holy Trinity, the Roman Catholic Church. (See links below for a plethora of similar examples.) Bergoglio is the perfect embodiment of everything that is wrong with the Modernist Novus Ordo religion. 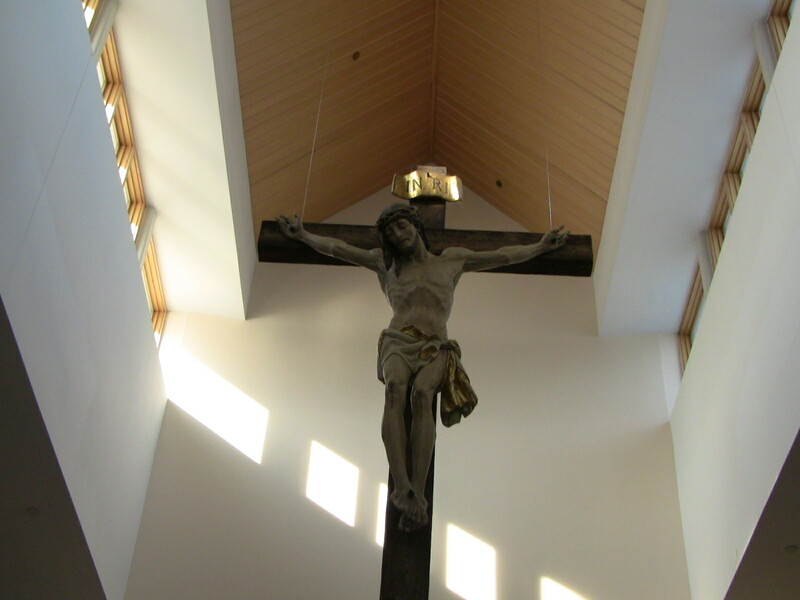 The symbolism of this wicked sham of a crucifix, however, is quite fitting for the Vatian II Church, for it portrays its theology accurately as distorted, ugly, Modernist, Satanic, and devoid of any Catholicism, goodness, truth, and beauty.